Today is the feast day of Clement, the patron saint of Vienna. 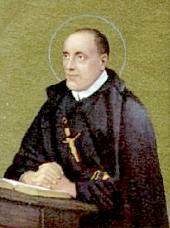 Born in Moravia the day after Christmas, 1751, Saint Clement came into the world as John Dvorák. His father was a butcher; John was the family’s ninth child. Moving to a Germanic area, the family name changed from Dvorák to Hofbauer, though it was not to be the last name change for John. Mr. Hofbauer died when John was six; his hope to become a priest died, too, as the family could not afford the ecclesiastical education such a desire would entail. Instead, he became an apprentice baker at a monastery in Bruck. For a while, he lived in a hermitage until they were abolished by Emperor Joseph II. John continued his work as a baker in Vienna, but made three pilgrimages to Rome. Third try lucky: someone offered to sponsor his priestly education. By then John had taken the name Clement Marie and had joined the Redemptorist order in Rome. He was educated in both Vienna and Rome before his ordination in 1785. Clement was assigned to Vienna, but he traveled as a missionary to Poland, taking several companions with him. They worked with the poor, built schools and orphanages and doing what Redemptorists do best: preaching. [Any American Catholic from the late 19th century to the mid 1950’s will remember those long, long “Forty Hours’ Devotions” which descended onto their home parish annually for a Catholic-style revival. Those priests were members of the Redemptorist order. Clement sent missionaries to Germany and Switzerland. However, Napoleon suppressed religious orders and tossed the leaders into prison. Clement spent 1808 behind bars before being expelled to Austria. He spent his remaining years in Vienna, helping to build a Catholic college and working against the establishment of a national church in Germany. In 1820, the man known as The Apostle of Vienna - Clemens Mary Hofbauer - died of natural causes. He was canonized in 1909 by Pius X. 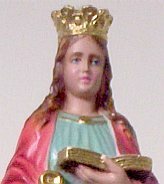 Information taken from The Catholic Calendar of Saints. Wikipedia has good information on the history of the order of the Redemptorists, also known as the Congregation of the Most Holy Redeemer. So, Dymphna, don't keep us in suspense. Tell us, what is the secret meaning of "Blessed are the meek..."? I don't think I've heard this one. When we speak of St. Clement, I naturally think of a much earlier saint, the fourth Bishop of Rome and a martyr (c. 100 AD). I would rather imagine that this man is the source for the name adopted by Clement Marie Hofbauer. There are several other saints remembered on this day, including one from the first century AD, St. Longinus. It is a busy day! St. Longinus is even more of a myth than St. Christopher. I was surprised to see that he's still extant. "They" were supposed to do a thorough job of housecleaning. Must have been a political battle; someone in authority held out for Longinus and so he stayed in the club. Clement of Alexandria, one of the Patristic theologians that I remember skimming thru, was responsible for the codification of formal periods of fasting. Thus, the meek inherit the earth because they know that all God's gifts are theirs. IOW, a major attitude adjustment. When one of my children was quite young, he was given a card with the Beatitudes on them. Pointing to the reward for meekness he said excitedly, "Look, it says I'm going to inherit some property!" Fortunately, dredging up that long-ago sermon, I told him I'd explain it later...he was disappointed with my version of his reward. Thanks for the additional explanation on the meaning of "meek." That was quite worthwhile. You obviously got a good Catholic education, and it did you no harm at all! If I were Viennese, I'd want to dump Clement in favor of Marco d'Aviano.